God bless Ritesh Batra, raves Sukanya Verma. Just hop on one of the numerous jetties across the bustle of the Gateway Of India and the breeze of Bombay will talk to you. 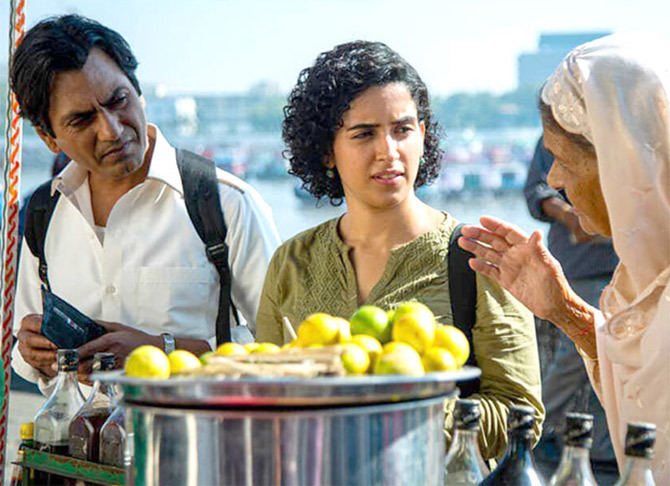 It's not a myth, you'll see, when the softly caressing winds whisper something soothing into Miloni's (Sanya Malhotra) ear and bring her wandering mind back to shore. There's no glamour at Gateway itself. Neither a venue for spectacle nor splendour, the likes of which we saw in Parinda's face-off or Bombay's day out; the unadorned, unfiltered frames (shot by Tim Gillis and Ben Kutchins) are cluttered with crowds and noises of sightseers and sellers. Though Rafi (Nawazuddin Siddiqui) represents one of the faceless people inhabiting the city, his workstation is, ironically, its greatest landmark and most photographed face. A street photographer offering the Taj with Gateway of India, it's quite a deal falling on many a deaf ear until Miloni comes along. Ritesh Batra's Photograph is about Rafi, Miloni and Bombay at its gentlest. The city of bhajiyas and monsoon, classic architecture and matchbox homes, ice golas and Irani cafes, humouring doctors and flourishing coaching classes, grubby single screen theatres and bargain-friendly markets, chatty cabbies striking conversations over native towns or smart-alecky ones speaking out of turn is not just a mood or backdrop in Photograph. Sometimes shaped by the homesick recollections of a domestic help, sometimes by the grand gestures of a Parsi man and his Campa Cola-loving wife, Photograph would just not be the same in any other surrounding. Its culture and character, always so alive and breathing, become the voice of Rafi and Miloni's quiet connection. Batra, distinguished by his sensitive film-making in The Lunchbox, The Sense of an Ending and Our Souls at Night, has a knack for making his actors forget about the camera. Nothing ever seems filmed. Or designed. Photograph, which premiered at the Sundance Film Festival earlier this year, unravels soon after Rafi clicks a picture of Miloni. When Rafi sends a copy to his grandmother (Farrukh Jaffar) in the village hoping she'll stop pestering him to get married, his plan backfires. Instead, she lands up at his door wanting to meet Noorie -- that's what he has named her inspired by the song playing on the radio that time. Rafi shares a roof with a bunch of fellow immigrants, erstwhile farmers who've left their homes, wives and children in village to pay off debts or in lure of a better life. Life is a struggle, but a sense of humour and spooky episodes help to get by. Noorie could, but Miloni does not fit in this picture. A 20-something, soft-spoken chartered accountancy student, Miloni is a class topper whose pictures are splashed across billboards promoting the coaching classes she attends. As keen they are on her academic progress, her middle-class Gujarati family would love to see her settle down with a NRI, MBA-qualified groom. But it is the photograph at 'Gateway Ke Saath Taj' that sparks something into her dull existence confined to the study table, dining table and classroom table. It is like she is no longer invisible. Miloni is a terribly repressed character. A passing mention reveals how her artistic temperament was nipped in the bud to focus on studies. Well-meaning parents can be cruel too and not even know it. Except Photograph is not interested in conflict of any kind. In Batra's cordial, pensive worldview, revolt doesn't always have to be vocal or aggressive. Some protest in silence, too much silence. And so when Rafi approaches her with his predicament, Miloni sees an escape from her stilted ways in role-playing. Her face lights up, perhaps for the first time, as she narrates her fictional life to Rafi's grandmother. Her reward is a pair of silver anklets, sloppily wrapped in an old cloth and crumpled newspaper. Though her maid (a splendid Geetanjali Kulkarni) wears a similar pair, Miloni is far from snooty. After spending all her life fulfilling someone else's idea of what her life should be, the divide created by class and religion seems irrelevant and cannot stop her from pursuing an emotion she craves. What exactly her inscrutable silence does not spell. God bless Batra then for picking Sanya Malhotra to play her. It is a staggeringly internalised performance. Miloni's sweet simplicity and idyllic dreams might seem like phony aspirations of an entitled life, but in Sanya's skin, they acquire the wistfulness of a lost, clammed-up soul making do in a life that is not after her own heart. 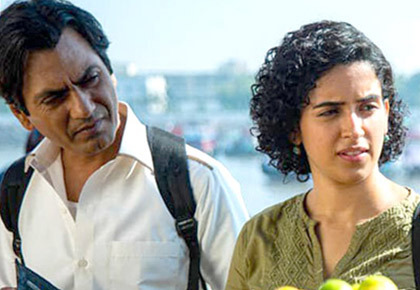 Nawazuddin Siddiqui has played an everyman before but there is no repetition. He lends a unique texture to Rafi and underscores the context behind Photograph's softy and kulfi personality type analogies in his tender, protective portrayal. His scenes with his sharp-witted Daadi, a delightful Farrukh Jaffar, provide several light moments in a mellow romance. As do Jim Sarbh's pushy tutor and Vijay Raaz in a wacky cameo. But it is his scene with Miloni when Rafi, the singer, croons Tumne Mujhe Dekha Hokar Meherbaan from Teesri Manzil on behalf of Rafi, the street photographer, that Photograph achieves a new level of sublime. Whether this frustrates or fascinates you depends on how you read Photograph. For a picture is a moment, it doesn't commit, it contains. That is the beauty of Batra's delicate little gem. Watch out for Sanya Malhotra! Aamir announces his NEXT film!